Learn More about Startup Tree! While our core curriculum focuses on entrepreneurial strategy, finance, and marketing, our electives run the gamut from Venture Investing to Software Entrepreneurship, from Grand Challenges for Entrepreneurs to Biomedical Entrepreneurship. The Buerk Center focuses on the strengths of the University of Washington and Seattle, and creates new courses that capitalize on those strengths. Seattle and the Cascadia Corridor is a magnet for entrepreneurs. It has an entrepreneurial culture, research powerhouses, support for early-stage entrepreneurs, sources of capital, a talented pool of workers, and a strong media to tell startup stories. 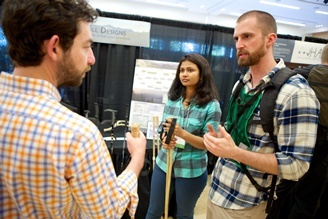 The Buerk Center celebrates this ecosystem annually with a series of innovation and startup competitions open to students at accredited colleges and universities across the Cascadia Corridor – Washington, Oregon, Idaho and British Columbia. A premier Foster School event involving more than 400 alumni and entrepreneurs as judges, mentors, supporters. Thanks to UW alumni Neal Dempsey, the Business Plan Competition is now the Dempsey Startup Competition! Encourages students to solve our world’s most pressing environmental problems with innovations that have market potential. A groundbreaking platform for innovation in the rapidly growing industry of health and healthcare. Our accelerator helps early-stage, student-led companies get off the ground with six months of help from expert mentors and up to $25,000 in follow-on funding. Apply now for the 2018 cohort. Open to all undergraduate majors, the Lavin program provides students with the experience, skills and know-how to succeed in their future business ventures. Applications due October 22. UW graduate students can earn a certificate in entrepreneurship while gaining real-world experience and mentoring from the best of Seattle’s thriving entrepreneurial community. The new 12-month Master of Science in Entrepreneurship is offered by the UW Foster School of Business and the Buerk Center for Entrepreneurship. This program will prepare you to launch by giving you the knowledge, mentoring, experience, and connections to build a high-impact startup. Come to our team formation nights to meet fellow entrepreneurial minds with the skills or ideas you need to enter a competition! You can find our full schedule on the calendar below. If you’re looking for team members, wanting to enter a competition, or work on a startup project, create a profile on our new AdvisorConnect site (launching soon). Offer up your skills to build your team! NOTE: This site is for current students only!